Bring salted water to a boil in a large pot and cook pasta until al dente, about 8 to 10 minutes. Drain. Preheat the oven to 400°F. Butter a large baking dish. In a medium saucepan, heat the butter over medium heat. Once it has melted and begins to bubble, add the flour. Cook, stirring continuously to make a roux or paste until you get the desired color (I go for light brown and a toasty aroma), about 2 minutes. Pour the poblano chile mixture into the roux or paste, stirring as you do. Add salt and freshly ground pepper and cook until the sauce thickens, about 10 to 12 minutes, occasionally stirring. If it gets lumpy, you can smooth the sauce by beating with a whisk. Add 3 cups of Monterey Jack cheese and 1 cup of Pecorino Romano, mix well, remove from heat and stir until well combined. In a large skillet set over medium heat, heat the olive oil. Add the onion and cook until completely soft and translucent, about 6 to 8 minutes. Add the corn kernels and cook for a couple minutes. Add the zucchini, sprinkle with the remaining 1/4 teaspoon salt, mix well and set aside. We don’t want to cook the zucchini here, as it will cook in the oven. In the large pot, where the pasta was cooked, add the drained pasta, poblano chile sauce and sautéed vegetables, gently toss to mix. If using fried bacon, add it in here! Pour into a buttered baking dish, top with the remaining grated cheeses and place in the oven until the top layer of cheese has melted and begun to crisp along the edges, about 25 to 30 minutes. Serve hot. I want to make this Mexican Mac and cheese but I was wondering if you could use any other kind of Mexican cheese just to keep it authentic I’m the only one that eats spicy so I can only make 1/2 the recipe. Oaxaca Cheese and Cotija Cheese would work to substitute for the mozzarella and parmesan, Mike. Enjoy! Yay for a permanent spot at the Thanksgiving dinner! So happy to hear that, Lorena. Have a wonderful Thanksgiving, Florencia! Pato, this looks delicious! What would you recommend serving it for a dinner? Oh any salad would go really great with it…like: https://patijinich.com/recipe/arugula-avocado-salad-with-date-and-walnut-vinaigrette/ or any veggies like: https://patijinich.com/recipe/roasted-broccoli-cauliflower-with-queso-cotija-dressing/ And lots more on my site. I make this for my daughters on St. Patrick’s day so we can have funny green food that isn’t dyed, and they ask for it all year! So yum, tasty and not too spicy. We love it! Oh that’s awesome! I’m so happy to hear that family loves it, and say hi to your daughters for me, Erin. Oh those crispy bits are delicious! When I saw this episode, I had to make this for Thanksgiving and it was loved by all! What a fabulous recipe. So cheesy and full of flavor. Love your show and can’t wait to make more of your recipes! This was so easy I did from memory except I added a handful of chopped cilantro to the zucchini mixture. It’s cooking now and I can’t wait! But I know if it tasted good going in the oven then it’s even better coming out. Thank you for this. ? Annie I’m super happy you and your husband enjoyed the mac ‘n cheese! I’ve done a version of this three times. Basically I roast the Poblano Peppers, peel them, de-seed them then chop them and blend them with milk and some flour in the blender and I don’t strain out the bits, a bit of green with the macaroni seems fine to me but then still do the rue with oil and flour then pour the Poblano milk mix in the pan until thickened. I go ahead and use an 16oz of extra sharp cheddar blended into the mix after it thickens. Mix with a 16oz elbow macaroni that’s been cooked, drained and cooled and after that 12 oz of bacon cooked and chopped. A bit of grated cheese on top with some Italian Bread crumbs, cover and put in the refrigerator until it’s time to cook it in the oven. Good times. I would have never thought to experiment with the Poblano peppers if I hadn’t seen Pati blending that on the show as I flipped through the channels and saw her and then stayed for the rest. 🙂 Good stuff. Hi Karin, Thank you for your message! Sounds like a wonderful meal — so happy you guys tried the Mac ‘n Cheese!! I just saw your episode and have to say your recipes were mouth watering. I am going to cook the macaroni and the chicken wins tomorrow. I cooked this with the modification of cooking the veggies in the bacon grease and adding some bacon on top – I was taking it to a “Bacon-Off Party” and everyone liked it! My boyfriend is from Mexico and I’m from the States, so we always enjoy watching your show and it’s a great conversation starter for us to share our cultures with one another. The different places you visit every week introduce me to new places I’d like to vacation and eat all the time! Keep up the amazing work! You, know, Emily, you are correct! I just wanted Pati to get the feel of the word no one can pronounce. Coming from New England, there is a town called “Worcester” (As in Mass.) that many have problems saying. By the way, Emily, there is no “E” in my name. Let us get back to Pati’s delicious, spicy, and excellent cooking. As Jack Pepin says “Happy Cooking”. I used crab meat instead of bacon… I loved how all the flavors came together!! “Pati, finally, I made the mac ‘n’ cheese dish”. May I say it was “SMOKING”. The second time I made it I did not have pecorino cheese, therefore, I made it with the best Wisconsin sharp cheddar cheese – it was still great. In addition, I like cooking with the white onions since, I have a tendency to use sweet onions, only. I am looking forward to trying many of your recipes..”you can cook, girl”. By the way “Worcestershire is pronounced, sounds, like (Woo-chess-shy-er)”. Hi Pati. Just saw this episode and my husband actually clapped when you added the bacon to the mac and cheese. We LOVE your show and use your recipes at least once a week. Thank you for explaining things so well! So funny! I’m thrilled to hear you use my recipes often!! I’m so excited to make this recipe for a Mexican themed, July 4th party. Can I make it a day ahead or is it best to make it the same day? I want to make extra to keep for myself. How long will it keep? Can it be stored in the freezer or would the cheese not thaw properly? Lots of question but this looks so yummy…I can’t wait to taste it. P.s. I love the YouTube video of you preparing this recipe. You are so easy to understand, step by step, instructions beautifully done. I enjoyed the end where you talk about your boys love for bacon. Love your show. We tried the mac and cheese recipe……WOW. It was great. The zucchini and corn really add a nice touch. We plan to make this part of our culinary repertoire from now on. Oh that just made my day, Bill! I am looking forward to maling this reciep. Since I already have roasted poblanos in my freezer I’m thinking of using them instead. I think the flavor of the roasted poblanos would give a great flavor. I would also like to know why strain the poblanos when you could use it all? Also, kudos on your reciep on the Mexican Lasagna. The first time I made it I thought it was too much just for me so I was going to send the better part of it home with my son-in-law so my daughter would not have to cook dinner that night. Once I tasted it I was hooked. Over the next day ot two I ate the whole thing. It was simply delicious.Of course I had to make one for my daughter and son-in-law they loved it. Thanks Pati. Hola Irene, So happy you are going to try this recipe. It will be fantastic with the roasted poblanos & you don’t have to strain the poblano puree — it will just be a less smooth sauce, but will have lots of poblano flavor. Hola Michelle, THANK YOU so much for your message & for watching!! Yes, bacon does make everything better. I hope you make the Mac ‘n Cheese for your mom. Hola again, Pati! Just wanted to tell you that I MADE your Mexi-Mac and it is TRULY..THE..BEST Mac n Cheese I have ever had–and, as a Southerner (Alabama), I have had a TON. I love what the poblanos do to the cheese sauce. Wow. Thank you for a great recipe. It is definitely a keeper! Hi, I love, love, your show – and- I am not even Mexican. To me, you have a great personality, and you are right up there with: Lidia’s Italy, and other master chef’s of cooking. I have not tried the recipe, yet, but, I already make ‘Killer mac and cheese’: your recipe is a new twist. Keep up the good work – in addition – I like the fact that you work in jeans – love your kitchen. Thanks, Rosanna!!!! I hope you like the Mac & Cheese when you give it a try! I’m so happy you are going to make these! Thank you!! I am enamored with your show and try to never miss it! You are so easy going about cooking and I’ve learned so much! When I visited Mexico we were served a seasoned black bean paste, sort of hummus like, presented as a condiment on my plate at each meal. It was so yummy! I’ve tried to make it at home but I don’t seem to get the flavor the way I remember it to be. What is your recipe for this Mexican hummus? You don’t have to subscribe to TIVO. If you have cable or satellite TV you could buy or rent a DVR directly from the cable or satellite company. Or you can go down to your local discount store and buy a VCR or DVD recorder to record from your cable box or satellite receiver. Instructions how to hook up are in the DVR or VCR box. Local broadcast TV is free, no subscription cost if you have a TV antenna. Use a VCR or a DVD recorder to record the show from your TV or digital converter box that is connected to a TV antenna if the show is available locally. Ask some kids how to hook these things up 🙂 They are pretty good with technical stuff. I made this for Mother’s Day and it was a huge hit with everyone! I’ve been experimenting a lot with mac & cheese lately, and it was so cool to find a more creative, flavorful twist like this. Also, I’m crazy about the show; it’s totally my favorite part of the local PBS rotation. I absolutely loved this idea, Pati! I really want to try it with fire-roasted poblanos. Do you have any ideas on how to get that deep smokey flavor, but also keep the beautiful color and texture of the original recipe? Hola Neal, You can try it with fire-roasted poblanos. Just char the poblanos as you usually do, then seed and chop them, and use them in the recipe as written. It will be beautiful and delicious!! Just a quick note, to say Hola, and Gracias. We are having our gay pride celebration in June, and everyone usually brings liquor or a dish.. I am above average in the kitchen, but in my group, above average doesn’t cut it, you have to me original, creative, and imaginative, in order to get a sincere nod of approval. 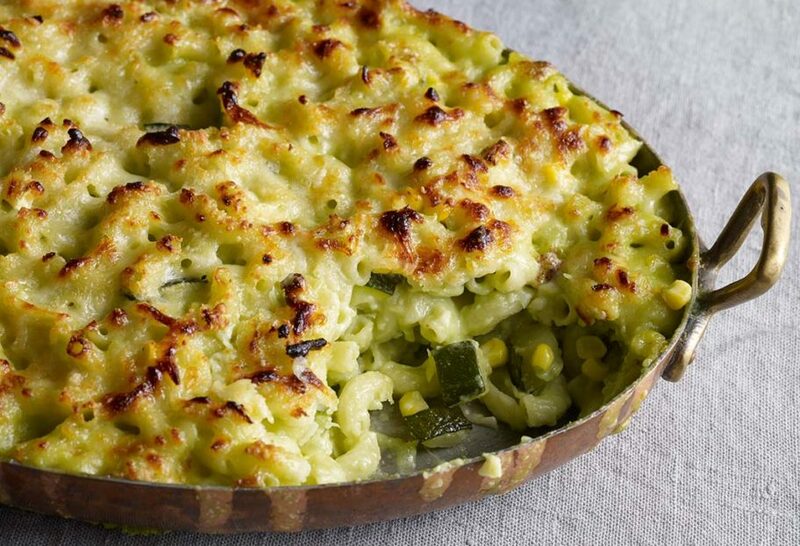 Your Mexican MAC & CHEESE will be the perfect dish to bring to the event. Its basic enough that the younger kids are gonna luv it, but different enough that the adults will want seconds. OMG Vic, my pleasure, I can’t wait to hear what your friends think about it! Loved your Mac N Cheese recipe. Tried it for the first time on Easter Sunday. Had a few friends over and they raved about it. My husband was a little nervous because I had not done a trial run. My friends laughed and said there was always “plan b.” No plan “b” needed it was great and I sent the recipe via e-mail to all who came over for lunch. What a change from regular Mac n Cheese. Soooo tasty. I also included the bacon. Awesome. Some of our stores and even seed catalogs list Poblano peppers as Ancho Peppers which are dried Poblano peppers. Hola Mariya, Sometimes stores in the U.S. label poblanos as pasillas! Don’t know why they do this!! I happen to see your show for the first time and couldn’t wait to try this. I just made it and it’s the best Mac and cheese I’ve ever had in my life. Thank you so Much for sharing this amazing recipe. I know my family will love it! Hi, I watched your TV show today and you made a Mexican hotdog. but i cant find the recipe and I don’t remember how you made it. Hi Anne, Thank you for watching! Here’s how you make the Sonoran hot dog…Grill a turkey sausage and wrap in bacon, then split in half and add 2 tablespoons of grated melty cheese (such as mozzarella or monterey jack), and place back on the grill. Butter a hot dog bun and heat on grill. Assemble the hot dog in the bun, and top it with sausage, mayo, mustard, ketchup, chopped tomato and onion, and a grilled jalapeño chile. I hope you try it! Thank YOU for your lovely message, makes my work worthwhile. Love the show and your recipes. Our satellite TV PBS channels no longer carries your show. It was a pleasant surprise to find it on a semi-local “Create” TV channel off-air via regular TV antenna. I retouched the online photo of the dish. You may replace your dark online photo with my lightened version at no cost :-). I’m just trying to help you like you help us with your instructional TV show. Estimada Patti!! I love watching your program. We moved to Olympia, Washington from El Paso, Texas. My Mother was from Madera, Mexico and of course I grew up eating amazing Mexican food. As a foodie, I love making new and unique foods. Your program excites me and you make me homesick for the amazing foods and flavors that I grew up with and the way you reinvent foods. You are giving us great recipes that can be made by everyone and sharing the tastes of Mexico with us. Thank you for your excitement and love that you send us. Benediciones y carino! Hola Frances, Thank you very much for your message! I’m happy you found my program!! My mouth was watering when watching the mac n cheese episode. I just had to try to get the receipt. Being that we are trying to eat healthier, I will have to try to make it dumbed it down from the way Patti does it. It’s one of those once in a lifetime type dishes. The first time seeing you on TV I felt that I had to try your mac and cheese. I forgot the bacon, but followed everything else pretty close and it was great. I don’t even normally eat mac and cheese but will do this receipt again! Can’t wait to try your Mac and cheese…we have loves a chipotle Mac and cheese at a local restaurant this is going to be a perfect substitute and new favorite. Any thoughts on a recipe I have been wanting to recreate for years. I had a smoky poblano polenta once that I still crave to this day. Just wonder if your milk and poblano trick might work there too. I absolutely think so: it would taste incredible. Patti, your program doesn’t come on until later in the afternoon. It is so worth waiting for. I am never disappointed. Your recipes are originally imaginable, and you are so enchanting and a delight. Thank you for writing me such a kind and generous email. I am so happy to hear you enjoy my show: thanks for tuning in! The repeat of this episode is still playing but I couldn’t wait to print out the recipe for the mac&cheese. I’ve been watching your show since its first season, and I absolutely love it! Your clever recipes and and warm personality are a perfect match. And your timing is perfect, too! Imagine my surprise today as I watched your show featuring American classics with a Mexican twist. Your Mac ‘N Cheese Mexicano, Chipotle Agave Chicken Wings, and Extreme Brownies with Carmelized Pecans look very doable and delicious! I’ve been wanting to make dishes like these but didn’t know how to begin. Now I do!